I was just browsing the net randomly earlier this week and I came upon the Gargoyle Router Management Utility. I wasn't even reading about computers when I saw the site, and I was totally surprised to find that it's a GUI front-end for OpenWRT. 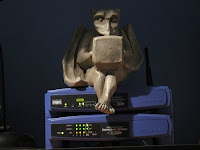 Gargoyle is based on the latest OpenWRT Kamikaze trunk, and aims toward usability for anyone. I really liked it after checking it out. I mentioned many times that I use the Tomato firmware for its simplicity and features. But after recommending and teaching about it to many others, I still find that eventhough it's easy for people familiar with configuring routers, it's very difficult and contains way too many technical terms for other users. Gargoyle is nothing like that. It only has the essentials in the web interface and the interface is designed logically. I've cursed at Tomato many times because the "save" button is placed off screen, or having to click "add" before "save". But having just the essentials doesn't mean it lacks features. Gargoyle is based on OpenWRT, so an expert use that really needs to change settings otherwise not available in the GUI can just ssh into the shell and set them from there. Additional web interface features include a QoS management screen, bandwidth graphs, connection logging, and URL logging. My favorite feature is URL logging since it's exactly what I need to be compliant to our draconian laws. Gargoyle is still in beta and a bit buggy, but I can see it will be my recommended firmware once it gets more stability. Oh, I had to buy another WRT54GL just to try it out because the two others I have on hand have other programs installed for learning. I admitted earlier that I know little about OpenWRT, so I've been studying and learning it and planning my next project based on OpenWRT, Gargoyle arrived just in time and now it looks like I'll base my project on Gargoyle and not the plain OpenWRT.